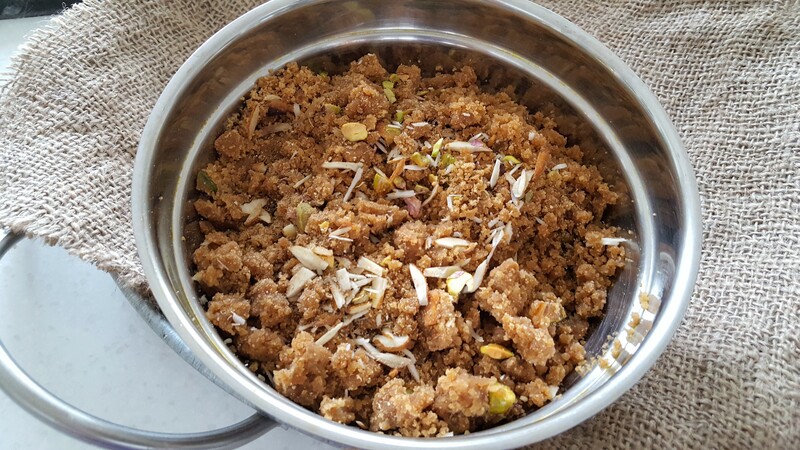 Flour Halwa is made with roasted plain flour, flavoured with cardamom, coconut, almond, ghee, cooked in sweet milk and garnished with desiccated coconut and more flaked almonds. The name I recall we used to call this super delicious “halwa” was “Manbog” I show I remember calling this dish. I think I have the right spelling but anyway, it one of our childhood favourite mum used to make especially at the week-ends. 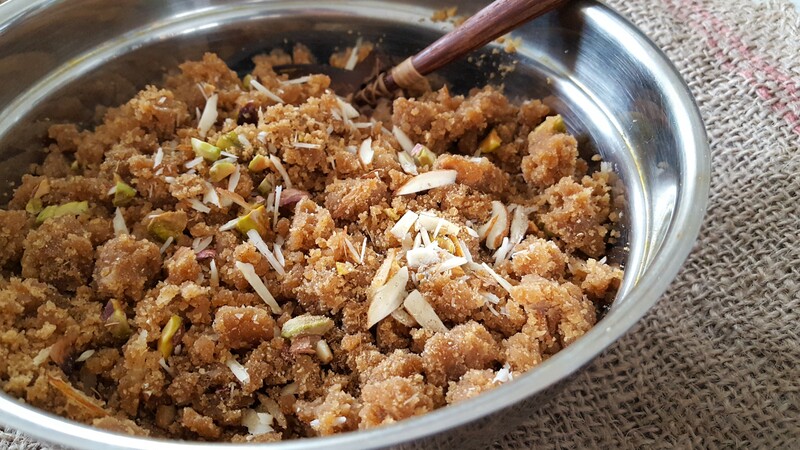 I still do such things at the weekend as it makes it all that special breakfast treats accompanied with a lovely cup of tea, this Halwa is a perfect treat to start the day. Made with enough ghee and aromatic cardamom, nuts is enough to get me going. As always my culinary journey this takes me back to when we were all little, and my mum would almost every day make little treats like these for us after school. Weekend was no exception, waking up on a Saturday or Sunday morning with the sweet smell of something delicious wafting through the house was enough to get us out of bed. It is a quick dish however needs a little bit of patience while roasting the flour, otherwise the flour will quickly burn and taste bitter. I always used to watch my mum cooking, so this is mama’s recipe with my little twist to it. My pleasure to share an old recipe that is very much liked by many. You can add orange peel to it as well. 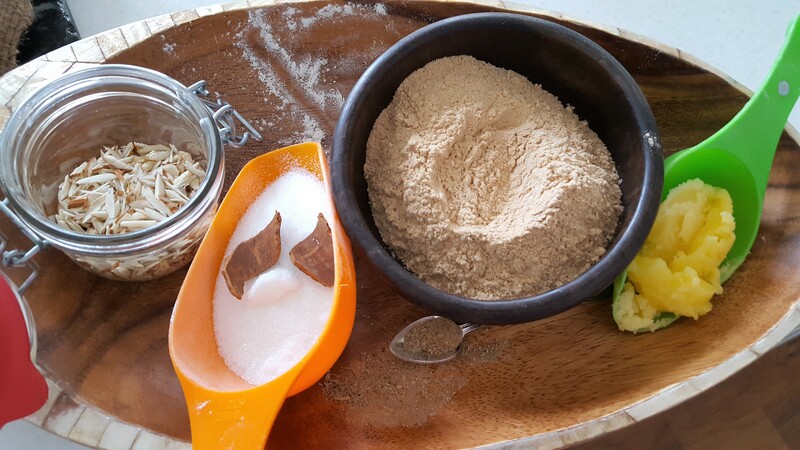 In a mixing bowl, add the roasted flour, sugar, cardamom powder and mix to combine all. As it starts to boil, slowly add the dry ingredients stirring vigorously as the flour will quickly absorb the liquid. Add some of the orange peel/rind. Turn the heat off, continue to mix as it will clump up, but that’s fine. Using a wooden spatula break the lump. Transfer into a serving bowl, scatter with chopped nuts of your choice. 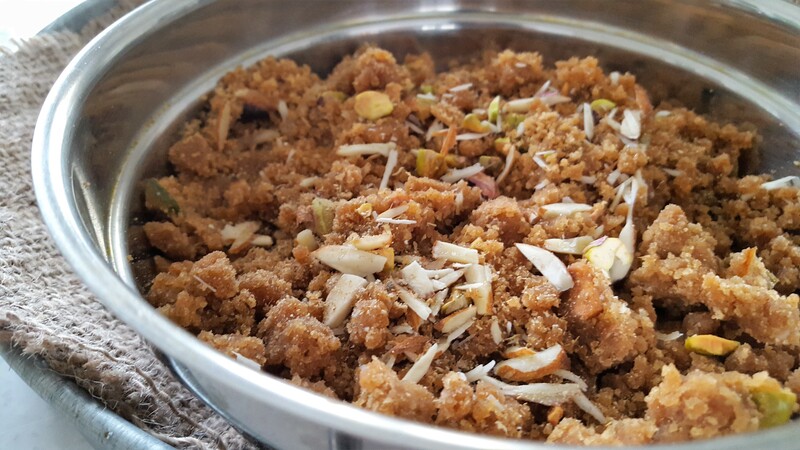 Flour Halwa can be eaten warm or cold. It will keep well for 2-3 days in the fridge. Brinda’s Note: When I make these I always make some extra for my day time snack. As it’s made with semolina, it’s quite a wholesome anytime snack, instead of eating other unhealthy nibbles.